Sometimes when demand exceeds supply it’s time to step up your game and increase production and so I needed to set up a new grow closet. I call it my super closet, partly because it’s bigger than my other grow closet and partly because I am hoping for super harvests. 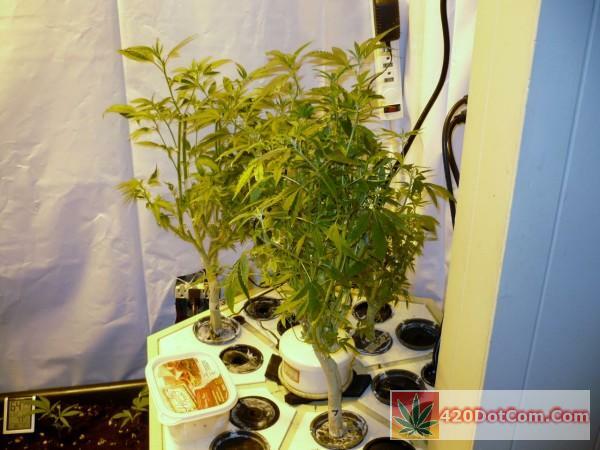 I learned how to grow weed in a closet by trial and error. I will tell you about my grow room set up, what gear I chose and why. 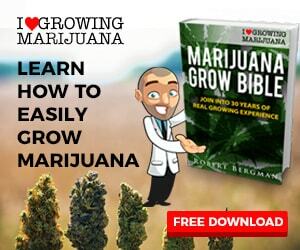 By sharing some of what I have learned it will hopefully help take the learning curve out of how to grow weed in your closet. 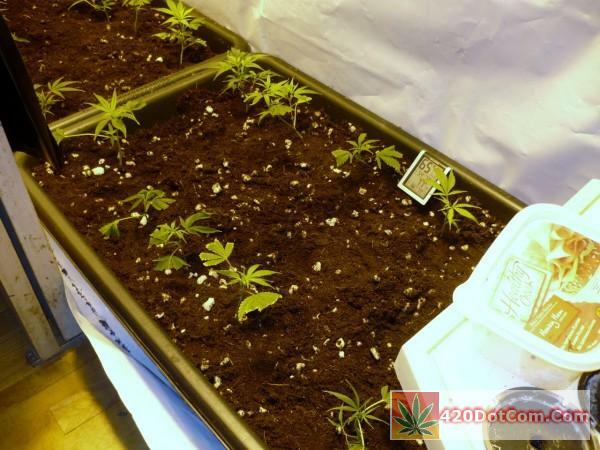 If there is just one thing that I would pass on, it is that proper ventilation is the most important thing for a closet grow. 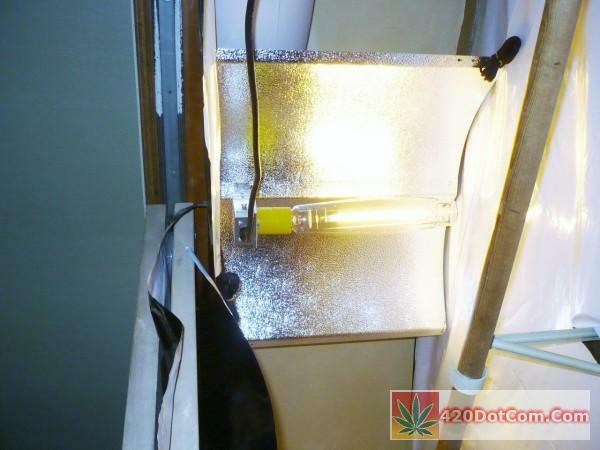 It is more important than your lighting or your grow system or anything else. 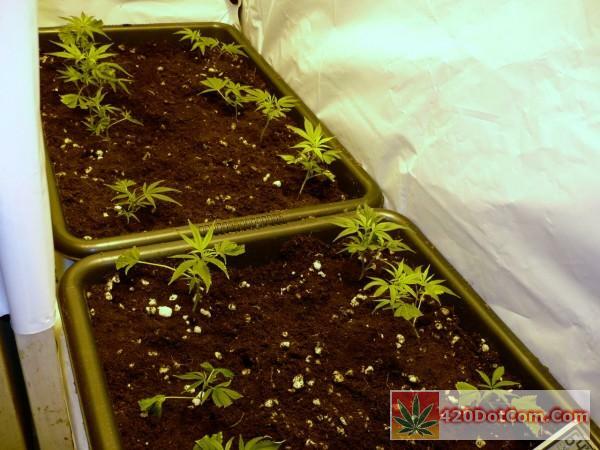 Temperature and humidity control is important for successfully growing marijuana in any grow room set up but it is absolutely critical if you are growing in a closet. With such a small area things can quickly get out of control. You must have a way to get fresh air in and hot, humid air out. Fresh air can be passive like under a door but you need to have an active exhaust. Whether that means cutting a hole in a wall or ceiling or venting into the adjoining room or some other way you have to have it. My grow closet measures 8 x 2 feet and has sliding doors across the front. My other grow closet produces well but keeping the heat down is hard especially during the summer. Because of the doors on this closet there is room for lots of air to enter. In addition the room it is in has 2 large windows. I have set my new grow room up to run days and the other runs at night. I did this to limit electrical load but it also means I will always have plants to play with any time of day. This closet is in a bed room that stays dark at night but as an added security measure my doors are baffled with overlapping panda film to prevent any light leaks. I wanted to have adequate cooling and I needed a quiet fan too. I think it is better to buy a larger fan than you think you need and throttle it down with a speed controller to make it quieter and control temperatures. So I chose a 8 inch Soler & Palau TD-200S from their silent series. It moves about 530 cfm on high or 409 cfm on low with no static pressure so its actual numbers will be a bit less. It isn’t silent but compared to other fans it is very quiet. I think once I insulate the ducting and add a carbon scrubber it will be really quiet and if not I can run it on low or get a fan speed controller for it. So far I am loving it. It pulls in so much air that the leaves are dancing even without an oscillating fan. 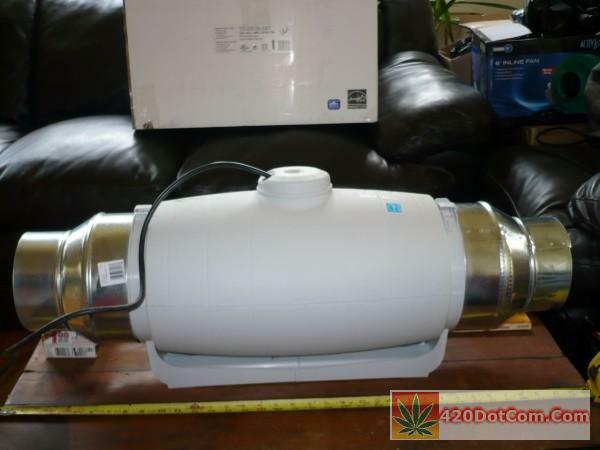 Odor control is important and although I love the smell of weed I don’t want anyone else getting a whiff. I am all about stealth growing. Even though I am 100% legal I don’t want anyone to know what I am doing unless I choose to tell them. I decided to go with a 6×24 inch Phresh filter rated at 550 cfm. I am tempted to go with the 8″ x 24″ rated at 750 cfm because the price really isn’t that much more but they are heavier and my ceiling is just sheet rock. The scrubber will be going in within the next few weeks so I have a bit of time to make a final decision. You can run a larger filter on a smaller fan and it will just last longer. But if you run a large fan on an undersized filter the air will pass through too fast to be effectively deodorized. The reason I chose Phresh filters is because they use superior activated carbon, weigh less and last longer. No, it’s not sales hype, it is true that Australian activated carbon is superior to other types and can last 2 years or more. 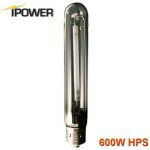 I know people grow with CFLs and LEDs but if you want the best bud you need to grow with high pressure sodium bulbs. I am using 1000w Eye Hortilux bulbs in my grow room because they give the best growth and have superior light spectrum and PAR. Don’t be fooled by lumen ratings. Lumens are what the human eye can see but PAR is what plants can use. I chose a medium Adjust A Wing Avenger for a reflector. I would have liked to get the large one but it wouldn’t fit in my closet. No matter, with wings set full width and a 1000w bulb the coverage and light uniformity is excellent. 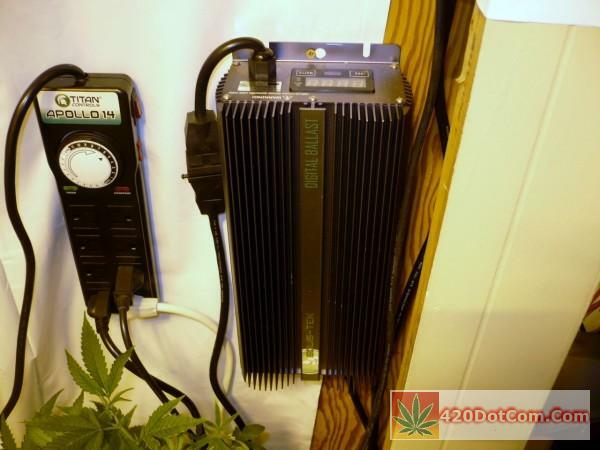 I have air cooled Blockbusters in my other grow closet and they work great but the glass can be a PITA to clean and it does cut your light by about 10% even if spotless. Took this laying on my back. You can see it just fits. You can also see part of my fan just above it. Also decided to leave the closet rod in because it could come in handy for tying up taller strains. I chose a SolisTek Matrix 1000w digital ballast to run my lights. They are heavy duty and have a built in timer. They also have an excellent track record for being reliable. Very pleased and highly recommend these. 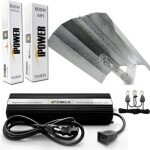 I have 2 Phantom 600w in my other grow and they are also great units but I am glad I bought a 1000 w ballast. I was thinking about running 2 600 watt ballasts and hoods in my new super closet because it is 8 feet long but decided to go 1000w because I could dim them to 600 anyway and the 1000s don’t cost much more than the 600 w ballasts. As it turns out I will only need the one hood and light for complete coverage. Because my closet is narrow and lined with panda film there is plenty of light being reflected everywhere. I am growing in a coco/perlite mix maybe about 25 -35% perlite. I am growing in beds. I used 2′ x 3′ mixing tubs from Home Depot for containers. They are cheap at about $12 and durable. 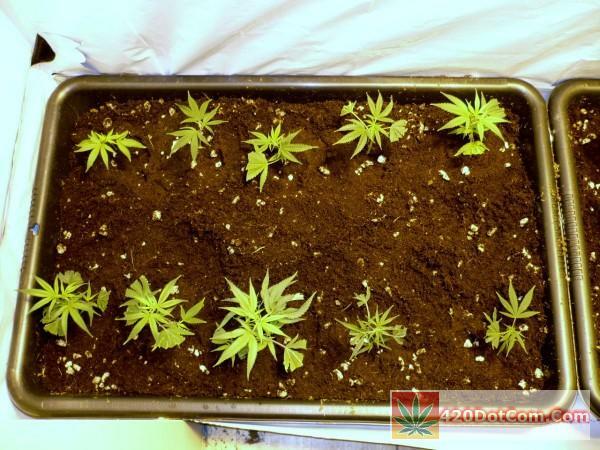 For this grow they are set on the floor and I will hand water. But in the future I will set them up to drain into a reservoir and run a recirculating drip system. Here are some addition pictures. The plants are Cinderella 99 clones and this is their first day of 12/12 lighting. The larger plants in my RainForest are 2 C99 and a Sugar Punch mother plants that I have renewed but I decided might as well flower them too. So there you have it a rundown of my new grow closet set up. I will be growing Cinderella 99 for its maiden voyage and will be documenting the grow. Hope you found this useful and if you did please share.